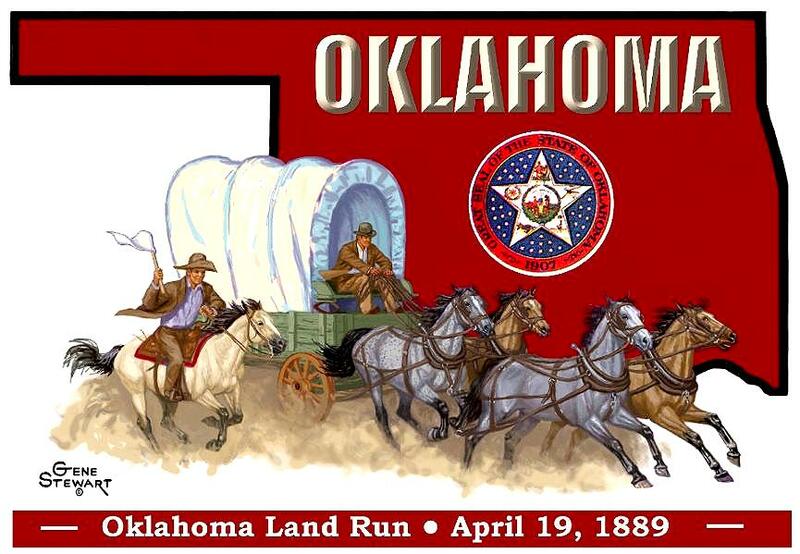 The Oklahoma Land Run is a series of caches that will run across the whole state east to west! This project will take some time to complete, but with Oklahoma Geocachers working together it will happen! The first Oklahoma Land Run began as a perfect spring day--bright, balmy and cloudless. The Oklahoma prairie was green with the new year, a little glimpse of paradise to the thousands of land-starved pioneers. This was it, the greatest rush for land in the history of mankind. More than 2 million acres of unassigned land in the heart of Indian territory were opened to settlement. 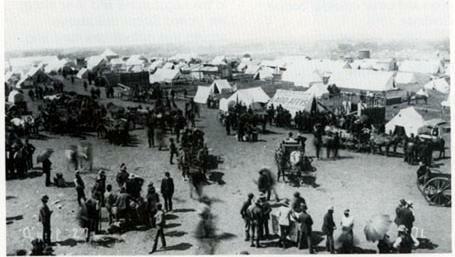 50,000 hopefuls surrounded the area to stake their claim for less than 12,000 homesteads! The rushers waited impatiently in all the little towns just outside the new lands: Darlington, Buffalo Springs, Silver City and Purcell. Then across the territory at high noon on April 19, 1889, blasts rang out from gun shot, cannon fire and bugle charge and the race started. During the next six hours, about 10,000 people settled in what became the capital of the new Territory of Oklahoma: Guthrie. The U.S. land offices were mobbed, both in Kingfisher and in Guthrie. Monstrous lines appeared instantly outside both, as men stood, usually for days, to register their land. By the time the red dust settled that evening, a new era had begun in Oklahoma. The foundation had been laid for this "Sooner" State. It took legislation, proclamations, five land rushes, a land lottery, and a land auction, to lead to settlement and eventual statehood of Oklahoma. At 10:15 on the morning of November 16, 1907, President Roosevelt took a seat at the cabinet table surrounded by a small delegation of government clerks and newspaper men. By 10:16 he signed the statehood proclamation and declared "Oklahoma is now a state." The center of series starts north of Guthrie, which was the first state capital for Oklahoma. The city has beautiful Victorian architecture, which provides a unique backdrop for Wild West and territorial-style entertainment, carriage tours, replica trolley cars, specialty shops, and art galleries. You will navigate through back roads and byways to explore the sprawling ranches, endless sky, miles of rolling grass dunes, windmills and the most unspoiled landscapes in Oklahoma. Discover charming small towns, scenic beauty, and local history that awaits you as you travel through the OKLAHOMA LAND RUN! Whether you are looking for a wonderful day trip or a multi-day immersion, the OKLAHOMA LAND RUN puts it all within reach. The west series will carefully navigate you through beautiful Oklahoma countryside twisting from County Road 76 to County Road 73. Finding its way to County Road 720 to Loyal, Oklahoma. Traveling north towards Highway 51, following west towards Texas. The series to the east will be a tricky one, following County Road 76 crossing Highway 33 to travel north to Hiwassee Road to County Road 74. Following County Road 74 to Langston, south down Choctaw Road. Traveling down to County Road 75, twisting through countryside heading north to County Road 720 into Cushing through Drumright along country state roads along highway 16 leading east towards Arkansas. The series does not have end points yet, since it is starting in the center and spreading towards its borders. The run will be set up by volunteers only. If you would like to add to series, please do so! Any help to continue this project will be great! Central Oklahoma Geocachers -COG- are excited to see this come alive! The caches were placed near or by either a driveway, a road shoulder or a turn-off intersection. So please look for these as your hunting the caches to pull your geocar off the roads. Not all roadways are paved so use caution while driving down the gravel and dirt roads. Please do not cross any fences while geocaching, there will be some no trespassing signs posted, but all caches are not placed on other side fences. Since they are placed in rural Oklahoma areas, you will find barbwire by many of the locations, so please watch your children during the fun. To keep the run going, please place caches back in same place as you found. With so many caches on this route, will be hard to maintain, any help will caches will be much appreciated. There are wild animals in the area so use Caution! 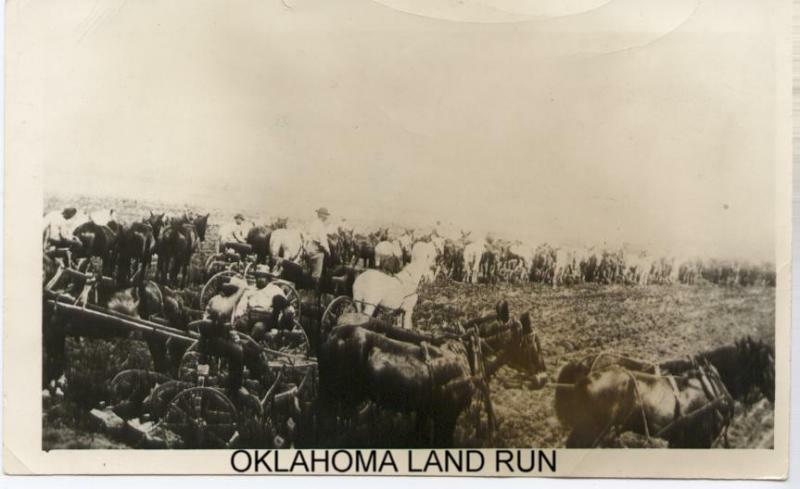 Click here to learn more about Land Run of 1889.